You don’t have to accept products as “green” or “healthy” just because the label says so. It’s odd that something truly non-toxic has become a rarity in today’s society, don’t you think? Somewhere along the way, it became okay for dishonest and disloyal companies to add chemical enhancers to their products all for the sake of making a larger profit… at the expense of the Customer’s. But, despite the history and the absurdness of it… it’s what we’re dealing with now, and it’s the reality we’ve got to fight against when we shop for cleaning and air purifying products. Which, understandably, is why the most common question we get is about our ingredients. Yes, only three of them. Other ingredients include water in the soaps, soda ash in the laundry booster to help disperse it in the wash cycle, and magnesium hydroxide in our liquid products since magnesium oxide (one of our main 3) actually turns into it in the presence of water. As the combination of powders comes into contact with toxins—either directly on a surface, through an air filter, or in water—the chemistry of the combination attaches itself to the pollutant and either neutralizes it or destroys it completely. 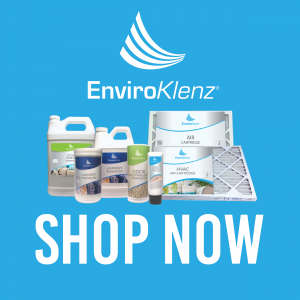 If you’re looking for an air system that helps eliminate mold and mildew, the Enviroklenz UV Model may be your answer. Should you want a more detailed summary of our Technical report click here.